Serving Southeast Michigan for all of your water purification needs. 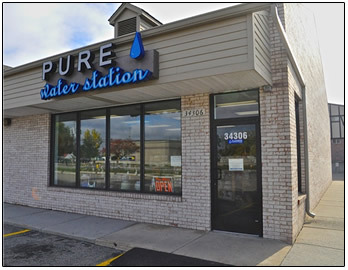 Located in Clinton Township, Michigan, Pure Water Station serves Southeast Macomb County Michigan for all of your water purification and water bottling needs. Call us today at 586.415.1498 to find out more. Or click below to get map and driving directions to visit us today. Our water purification process uses the latest purification equipment to ensure you have the best quality filtered water. We carry an extensive line of health & beauty products that are safe, without any added chemicals. We offer various organic food & supplement products, drinks, minerals and gluten free food products.